Good Wednesday evening!! Life has been crazy busy again. I remember a time when summer was about lazy days, playing outside with my cousins & friends all day long. I miss those days. I am ready for a slower pace right now, but I just don't think it is going to happen because of my job. I think I will be able to take a breath once the election is over in November. Sigh...that is a long ways away. Well, it is the time of the month when I am ready to post my Provo Craft projects. I had three somewhat specific assignments for the month of June, including a 12x12 layout, and 8x8 layout, and one other type of project. My first assignment was to use my Cuttlekids machine. I decided to use this for my "other" project, and did up this card with the Outer Space dies & the "Tadpole Alphabet" dies, which are completely adorable! Also featured on this card is the "Kids" paper collection by American Crafts. I thought it was a perfect fit for these dies! And last but not least, my third assignment was to do a project featuring any of the new "Solutions" cartridges by Provo. I featured the "Indie Art" and "Street Sign" carts for this one. This project is obviously the 8x8 layout that was assigned to me. They are harder than I thought...I am so used to the 12x12 format. This is about my little cutie Sadie, and her obsession with anything strawberry. She is so adorable! In fact...I cut up some strawberries tonight and she got herself a little treat! This layout also features the "Spring & Summer" paper collection by American Crafts. I love the bright colors and bold patterns of this paper, and felt it was perfect for the layout! Thanks for taking the time to look over my projects! I hope everyone is having a very happy week so far! Oh, if you have a spare moment check out this post on the Glitz blog. A new Christmas and Halloween release at summer CHA....going to be so fun to use!! I just see some hip seasonal cards in the making with these lines! Isn't it the weekend yet!? Oh my goodness Lea all of your projects are awesome as usual but that princess one is SOOOOO CUTE!!!!! These are all beautiful. Love the various cut outs. 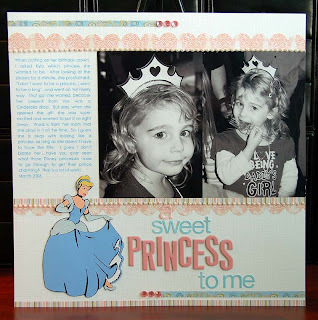 Sweetness girl--LOVE your PC assignments---that card is the cutest thing ever, and...umm..I used the very same paper, cartridge, and icons for my 12x12 layout----creepy that we think so much alike :) I knew I loved ya. LOVE LOVE LOVE all of this Lea!! Totally cute layouts too! Oooh! Fabulous projects! 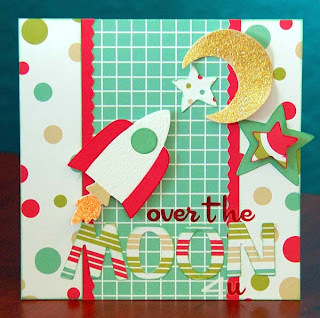 Love that card, how the rocket is heading toward the stars and moon! The Disney layout sounds like quite a challenge, but youdid great! 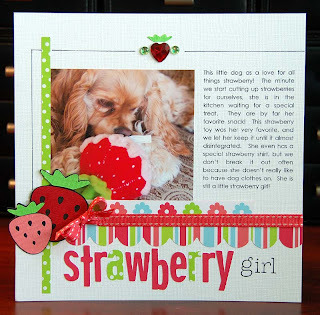 And the strawberry layout, love the pops of color and how you did the borders! Lea, awesome projects! Love the strawberry one! Great projects! I really like the sparkle coming out of the back of the rocket. Wow, terrific projects. Your layouts are as good as your cards! They are gorgeous, Lea!!!! I really, really love the Over the Moon card! I love, love, love your layouts! The strawberry girl is adorable. These are all adorable, but especially love the over the moon card! Too cute!